The clear and clean skies make stargazing in the Canary Islands really special. If you are a keen astronomer or you just love gazing at the night sky the Canaries are a great holiday destination. 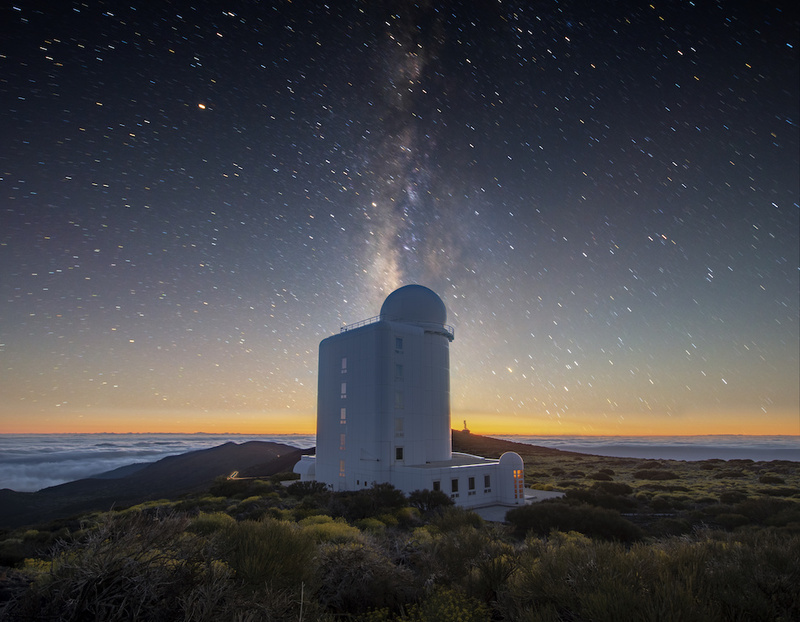 We have highlighted some of the best locations to enjoy stargazing in the Canary Islands. The highlands of Tenerife have been officially declared a Starlight Reserve. Teide National Park has incredibly clear skies and because of this it is a great spot to be enjoy the night sky. In perfect conditions it is possible to see 83 out of the 88 official constellations. Tours are available with professional starlight guides or you can chose to enjoy the night sky on your own. August is a brilliant month to visit Tenerife as there are an abundance of shooting meteor showers. Masca viewpoint is a large viewing platform over 1000 meters above sea level. For instance, you can see numerous constellations and alignments of stars. El Palmar is a great viewing platform where the Milky Way crosses the night sky. For that reason you can pick out gas concentrations, groups of stars and interstellar dust where stars are born. The Orchilla Lighthouse offers a natural platform to observe the skies in El Hierro. There is very little light contamination and the constellations are clear and visible to the naked eye. The whole island of Fuerteventura has been declared a Starlight Reserve. The Tefia Observatory in the centre of the island boasts a professional telescope and an observatory dome. The Morro Velosa viewpoint is a natural platform at 669 meters high. Situated on the Tegu Mountain you are able to enjoy shooting stars and breathtaking views. Another reason to enjoy this viewpoint is the lack of light contamination at this location. The Sicasumbre viewing point on the south of the island is an excellent place to view the skies. Although it is only 300 meters above sea level this is a great spot for astronomical observation. The Roque Saucillo astronomic observatory is perched in the centre of Gran Canaria. It offers educational activities, workshops and brilliant viewing conditions. In addition to this the facility has numerous telescopes and camera for the visitors to enjoy. The Temisas Astronomical Observatory provides an excellent program of educational talks and tours. There is a telescope dome, stargazing platform and lots of specialised equipment. The whole family will enjoy this facility and it is an excellent introduction to astronomy. The Llanos de Garanon is a brilliant spot for stargazing. At 1770 meters above sea level many stars and constellations are visible to the naked eye. La Palma has been declared a Starlight Reserve. The Roque de los Muchachos boasts one of the clearest skies in the world. It is the highest point in La Palma at 2396 meters above sea level. Furthermore, it’s location and conditions make it a fabulous choice for those seeking to enjoy the night sky. The viewpoint at Llano del Jable is 1200 meters above sea level and it provides a panoramic view of the sky. Even without binoculars some of the smallest constellations are visible. San Bartolo Mountain is 439 meters above sea level. As the area is almost completely free of other light sources the viewing conditions are brilliant. Beyond the dramatic slopes you are able to view some of the smaller constellations. San Antonio Volcano is a viewpoint at 633 meters above sea level. Most importantly, it is a great setting to be able to enjoy many of the constellations. To conclude, Astrotourism is increasing in it’s popularity. Without a doubt the skies over The Canary Islands are spectacular. In summary, if your passion is astronomy, we recommend choosing the Canaries as your next holiday destination.